The development of extraction techniques for oilsands and heavy oil has led to the growth in the use of heated oil storage tanks. The heat from oil storage tanks can "cook" some geomembrane materials over the life time of the tank. When tanks are heated for 20+ year design lives a special High Temp geomembrane is often needed for secondary containment. Layfield can help you evalute the need for High temp liners and then provide the materials needed for your application. 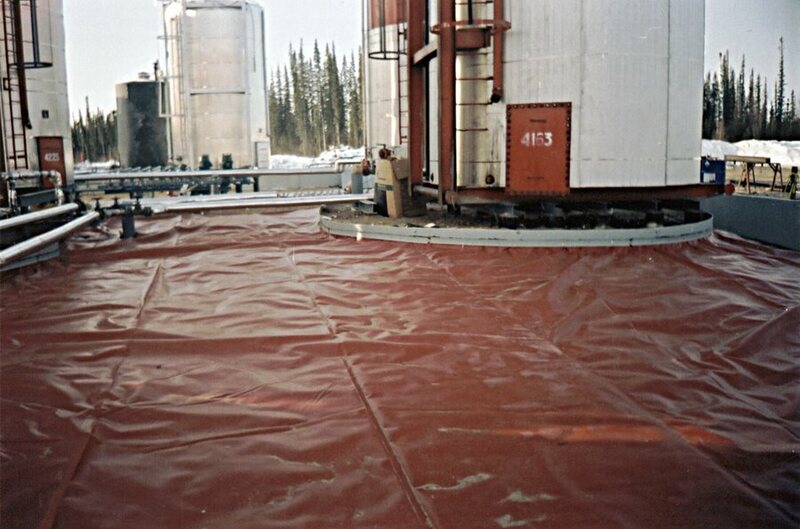 Layfield's High Temp geomembranes are specially formulated to resist degradation in high temperature environments when installed under heated storage tanks. Our High Temp 2000 and HAZGARD 5000 HT are both formulated for long term heat stability. We have also tested these materials for containment of typical heated petroleum chemicals such as bitumen, gas oil, and diluents. If you are working on an oilsands or heavy oil containment contact Layfield for design and installation information.